Or if you want to accomplish all of these things, I’d suggest you call Andy Cagnetta. Last month I attended the 12th Annual Andy’s Family Pasta Dinner to raise money for LifeNet4 Families, a local organization that provides hot meals to the homeless and emergency food provisions to families in need. What began a dozen years ago as a fairly modest gathering, with thirty of his family members and friends, Andy’s Pasta Dinner has become a larger-than-life annual event. Eight hundred people came out to support the event and it was very much a family affair. I sat at a table with a family comprised of three different generations who were attending for the first time, and a mother and son who were attending their twelfth consecutive dinner. I tried not to laugh out loud when the mother responded to my question about what brought her to the dinner. She replied, “I’m a friend of Andy’s.” That was my response to the same question just minutes before. I stopped counting at ten the number of times I heard someone proclaim the same thing. Andy Cagnetta is the CEO of Transworld Business Advisors, the largest business brokerage firm in the state of Florida. Through a joint venture with United Franchise Group, Transworld also sells franchises worldwide. The Company now has thirty locations and currently represents more than 1,500 businesses for sale. The business brokerage community has suffered some image issues over the years, but since Andy got involved with Transworld in 1995, he has worked diligently to create a company that engenders trust and exudes professionalism. He’s taken leadership roles in the industry, including serving as local president of the Business Brokers of Florida. As a former investment banker, I was pretty cynical about the business brokerage community, and there are some players in that industry who still give me the willies. But over the years, Andy and his team at Transworld have moved me from skeptic to believer to fan, and I continue to refer business to them. With Andy, there’s no pretense. He looks you in the eye. He instills confidence. He can be very direct (he is from Jersey, after all), but with enough polish, humility and warmth to make friends wherever he goes. Andy has learned how to compress about thirty hours of productivity into a twenty-four hour day, and yet most people know that he’s a completely devoted family man. 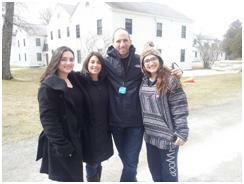 Talk to Andy for five minutes, and you know that his wife Alison and their two daughters, Rachel and Lauren, are the most important priorities in his life. Andy has a kind of Pied Piper effect on friends and acquaintances when it comes to community service. He picks those causes, events and people that can make a difference, and then he jumps in with both feet. His impact is being felt all over South Florida. In addition to his Annual Pasta Dinner, Andy has leadership roles in Junior Achievement of South Florida, Broward County United Way, Legal Aid Service, Security on Campus, and several other organizations. And when he asks you to help, you look at his involvement, you hear his passion, and you can’t help yourself. You make the time. You write a check. You show up. 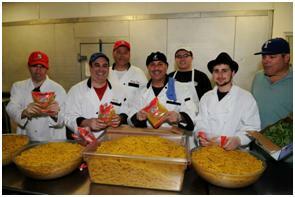 Midway through the Pasta Dinner program, Andy called up all the Junior Chefs onto the stage. These were kids who toured the LifeNet facilities, including the commercial kitchen where food is prepared, and they spent the afternoon stocking shelves in the food pantry. Student volunteers assisted the kids in creating their own personal fundraising pages and educated them on how to ask for donations. In order to participate, kids agreed to attempt to raise at least $500 to benefit LifeNet4Families, as part of Andy’s Pasta Dinner, and committed to bring at least one bag of food to the event. Andy’s 12th Annual Family Pasta Dinner raised more than $133,000 and the homeless and families in crisis in Broward County will benefit in the weeks and months ahead. But I got a hint of the long-term impact of the event when I watched the Junior Chefs walk up to the stage to be recognized by Andy and the crowd. 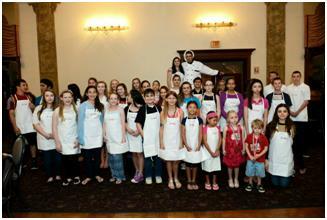 Forty-three kids of varying ages and sizes stood in their personalized “Pasta Dinner” aprons and beamed. As a group, they raised more than $24,000. And they knew they were making a difference. They hadn’t just learned how to get mom and dad to write a check so that they could get an apron. This wasn’t about earning service hours. These kids saw the facilities. They met the people. And they worked. Much has been written about the attitudes of the Millennial generation. They’re the largest generation since the Baby Boomers and are wired very differently than their parents. Baby Boomers created the “everybody gets a trophy” approach to raising these kids and now lament their entitlement mentality. Most social commentators suggest that his generation is driven by purpose, and motivated by causes greater than themselves. Some believe that this is the generation that will harness technology, create significant advances in medicine and will produce great leaders. That’s why I’m so optimistic, so long as people like Andy Cagnetta provide the example and the means to educate this generation of future leaders. The Junior Chef concept is brilliant. Financially, if the kids get involved, so will their parents. Acknowledge them in front of eight hundred people and they sense that this is pretty cool. But the real lesson is learning that sometimes the greater purpose can only be achieved by individuals willing to come together. To work. To make a difference. The Junior Chefs are learning at a young age about the needs of the less fortunate. They’re learning to give of their time to help meet those needs. They’re getting their parents, siblings, and friends involved. And they’re learning that it’s the right thing to do. I love this article. Well written and inspiring. You are a great storyteller and this painted a wonderful, compelling picture of the heart behind Andy’s Family Pasta Dinner and Andy himself. Thanks. and share thoughts. Greatt blog, continue the good work!